Can I get a tan through a window? Yes! The glass will block short wavelength (anything below 3,000 angstrom units, for you inquisitive scientific folks) radiation of the sun, but will still allow longer wavelengths of the suns radiation to pass through and affect your skin. That being said, even though you are protected from one spectrum of radiation, you can still get tanned from over exposure behind glass. While clear glass will allow around 75% of the light through, laminated or green glass will help to filter out all of the UVA light. Similarly this is why wine and olive oil is packaged in glass that is green. Can I tan on a cloudy day or in the shade? While clouds may block out sunlight, UV radiation can still pass through and will cause your skin to begin the pigmentation process as described earlier. As you may think that you are completely protected on a cloudy day in July, some experts still recommend using protection from with a light moisturizer with minimum SPF15. While tanning or burning won’t happen as quickly, it’s still good to be aware of the risks. Another important note would be to use sunscreen if you are near a reflective surface such as water, concrete, snow or ice, as these materials will reflect the suns radiation onto any of you exposed skin. I should get polarized lenses protect my eyes, right? Unfortunately, the polarization of glass has nothing to do with protecting your eyes form Ultra-Violet radiation. Polarized sunglasses only help to prevent glare off of reflective surfaces such as concrete or water, which can be beneficial if you are out on the water or driving but do not protect against UV radiation. 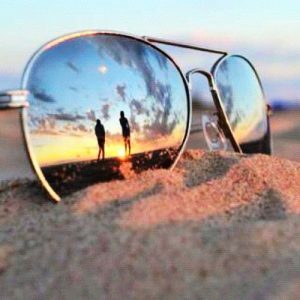 The most important properties when selecting sunglasses are finding ones that block 100% or 99% of ultraviolet light in both UVA and UVB spectrums. Because the front of the eye is subjected to 99% of Ultra Violet radiation there is a high susceptibility to intraocular damage. Cataracts, damage to the cornea and macular degeneration are precursors caused by the effects of radiation, and will ultimately result in visual impairment and even blindness. If I have a tan, I’m more protected from the sun and skin damage! False! The tanned look you have is because the skin has already been damaged, and yes, it IS trying to protect itself, so congratulations, you now have a built in SPF of….FOUR! Maybe. It is still important to ensure that you are taking great care to avoid excessive UV exposure through sunscreen, hats, and so forth. Do you have questions about health and fitness? Send them our way and we’ll do our best to answer them. Thankfully, topics regarding inorganic chemistry and advanced math don’t typically fall into “health and fitness” so…we’d have to refer you to a different professional for those kinds of questions. And no, a hybrid, two part question like “I would like to protect myself from the harmful rays of the sun and wish to construct an awning to do so. What kind of material will block the UV rays and if my house is 15 feet tall and I want an awning that provides 6 feet of shade, how much material would I need to construct this” still is out of our realm of our expertise. Though I would recommend using Pythagorean theorem and a sun dial at some point in your calculation if this were grade 8 math class.